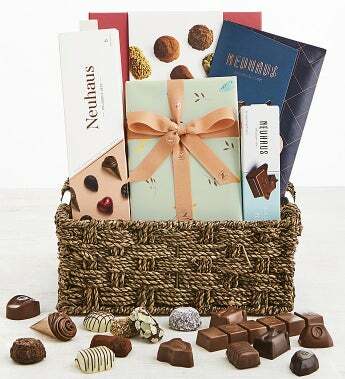 Neuhaus' Chocolatier has created this exquisite Premier Spring Gift Basket exclusively for Simply Chocolate. The ultimate in chocolate decadence, this impressive assortment features the Belgian Master Chocolatier's most popular tastes. Included are a 16-piece assortment of the "World's Best Chocolate Truffles", A six-piece box of pralines in milk, dark and white chocolate, a 17-piece Spring Ballotin gift box, an intense 80% cacao tablet with Ugandan origin dark chocolate and a silky smooth Belgian milk chocolate bar beautifully packed in a lovely artisan craft woven basket. Ttl Net Wt: 1 lb. 10 oz.